The AEC Buyers' Guide is an invaluable resource for product designers, specifiers, engineers and manufacturers. Once you've decided that aluminum extrusion is right for your next design project, the AEC Buyers Guide is the key to finding the right aluminum extruder. The digital edition is now available! 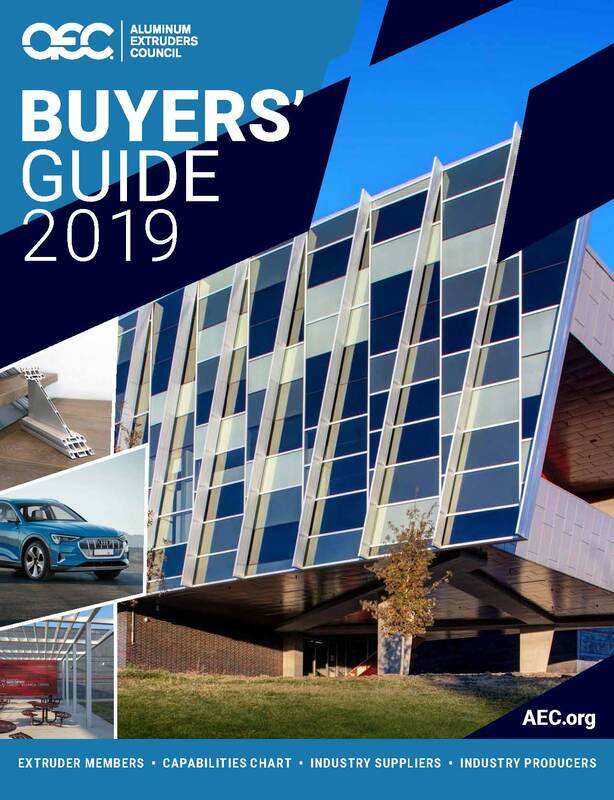 Click on the cover image to download and view the 2019 Buyers' Guide. If you prefer a printed copy, request your FREE print copy here! The AEC Buyers' Guide contains the latest contact and capabilities information supplied by AEC members. Inside you'll find essential information for Extruder Members on press sizes, plant locations, types of profiles produced, finishing and mechanical capabilities, and much more. In addition, the Buyers' Guide includes complete listings for Supplier and Producer Members. It's a complete directory of AEC members! Editorial features covering sustainable, innovative uses for extruded aluminum, attractive photos, and interesting facts about aluminum's advantages are scattered throughout the Guide. The e-magazine flipbook format offers simple navigation and convenient links throughout - and for ease of use, you can download a copy of the Buyers' Guide right to your own desktop. Thousands of designers, engineers, material specifiers, architects and others have already discovered the tremendous value of the AEC Buyers' Guide. You will too! You can also conduct an online search now by going to "Find an Extruder".